Before I start about me, I am proud of what we’ve accomplished with Design and STEAM at ISB in the past few years. And I’m excited to see what the future holds – as the team grows, as we move into a purpose built space, and as we continue to refine and develop our curricular program. Our ultimate goal is that all students at ISB get a range of design thinking opportunities and develop technical skills that will help prepare them for future careers, projects and life to make a positive impact on their communities and the environment. My two main goals this year are connected to CAPTIVATE & CULTURE. CAPTIVATE: Coaches who captivate spark and maintain learner interest in learning. They stimulate and engage learners by cultivating curiosity and inquiry and by making lessons interesting, relevant, and enjoyable. My goal: I want to improve my presentation skills both in workshop and presentation format. The WHY: I present a lot with my role. I like sharing. I get just as much from presenting as I do from being a participant (sometimes even more!). BUT, I get very nervous when I present. I talk too fast. I lose my place. My message and passion gets lost in the delivery. I love being inspired by a presenter, a keynote speaker, a teacher and I want to get better at this. Specifically, I need to work on presenting where there is “no feedback from the audience” – a big presentation on a stage and the first 10-20 minutes of a workshop. How I will measure this goal: I will get feedback from trusted colleagues and participants after presentations. I will use video to analyze different presentations this year. CHALLENGE: Coaches who challenge learners insist that they persevere and do their best work. They hold learners to high academic standards, encourage persistence, and monitor learner effort. My goal: I want to improve the feedback protocols we use in our classes and activities – through Integration, Enrichment classes, and Ignite Weeks. The WHY: Sometimes I feel like the feedback protocols I use are repetitive and don’t always get good quality responses from students. Carving out enough time to adequately reflect and give/receive feedback has been an area I feel like that I can continue to improve on. Also, I want to impact the culture of our students, especially as they enter more “high stakes” high school courses they want to know how do I get highest marks rather than critically looking at their own work and also collaborating with their classmates to help everyone improve. How I will measure this goal: I will have a resource to share with all teachers with different feedback strategies we can use as a whole school for design thinking and quality reflection practices. At the beginning of this year, I wrote a goals’ based blogpost. You can read it here. I will copy excerpts over to make it clear what I am reflecting on. I will model and support a culture of openness and sharing through collaborative practices, public reflection and celebration. Well, I wouldn’t say I was super successful in this area. The two indicators of success I had set for myself was more tweeting, especially beyond the celebratory posts and more blogging. I wasn’t totally quiet out there, but I wouldn’t say it was an amazing year for me with expanding or strengthening my PLN. I want to make sure I am contributing appropriately and meaningfully before I post. I also don’t want to just put things out there “just because”. I would like to contribute more, but I need to think more about what I want to contribute and how I can post in a timely manner, but do it thoughtfully. The second part of this sharing and collaborating was to be through blogging. I love blogging. When I run, I write blogposts in my head that I think are quiet fantastic, but on average 5% of those ever get published for a variety of reasons, mostly time. While I didn’t write reflectively on this blog as much as I wanted to, Sam and I did get the ISB Design & STEAM blog going this year as a resource and place to share work. I also posted more this year than last on the EdTech blog, but it wasn’t substantial. As I type this, I just want to think more about what I am writing and who I want to write for before the start of next year. I will facilitate personalised learning. My indicators of success were: I will reflect after each part. I think I did make more head way in this area. I probably worked mostly? in the high school this year. Which was great! But, I’m hoping to be more balanced next year. This year, I was able to plan and co-teach Design in the HS EAL class, where students design and created client based products for other teachers. They learned more about Design Thinking and had authentic language tasks, as one would in these experiences like: interviewing, seeking and understanding feedback from their client and oral/written reflection. It was a great experience and I’d like to provide more experiences like this to EAL students in the future, as they often miss a lot of these design and hands-on experiences in electives. I also worked on two projects with the BEAD Math course: one was a client based design project and the second was a entrepreneurial design project. I think both of these projects went really well and the students really created high quality products, however, there were not enough kids enrolled in this class to really make an impact on a lot of students. Still, NGSS Engineering Projects are my big invite into classes. This year, the Grade 9 Science teachers and I developed a new Engineering project which I thought was super successful. I think it was a great balance of challenging, developing skills and extending the students understanding of the science concepts: energy transfer. This year, I was able to revamp this course a bit and embed the ISB Design Process into the course. I developed it as a primarily independent course using our LMS. Another component I added to this course was a public “sharing” at the end of the course. Students could share their products and learning with any audience they wanted to. This helped a bit, but I feel that I didn’t extend that further. The course is interesting in design as the students who enroll in it are either high flyers who want to extend themselves or want to take an offering that doesn’t exist at ISB or it a course that students enroll in as an “easy” half credit when nothing else really fits into their schedule. I’m trying to break the stigma a bit, but students really need to be self-motivated to do well in the course. I also had an enrollment increase this year in semester two, I went from 5 students semester 1 to 11 students in semester two. I definitely want the course to grow, but it was really difficult for me to manage. It was easier for some kids to fall through the cracks. I was able to check their progress journal blogposts each week and give feedback that way, but I did not meet face-to-face with them that often, and I feel like that impacted the quality of some of the work and my relationships with those students. Increase student opportunities to personalize their learning with high quality enrichments and ASAs that develop skills and use design thinking as a process. For this, I think that I’ve been successful in some areas, but some, not so much. As far as After School Activities, I have not been that successful. I feel with my job, I am often in meetings at this time and I don’t want to tie up my other afternoons. Next year, I should commit to at least one “design-y” after school opportunity. Luckily, this year, the Design Assistant has facilitated two after school Open Design times: HS Makers Club and MS Makers Club. Enrichments – this has been an area of real growth this year. I have co-taught a few enrichments with teachers this year and it has been a really successful model. I have been able to up-skill the teachers and I’ve had fun teaching and using the classes/projects as sandboxes for other projects. I am particularly proud of the Dragon Design Enrichment I am co-teaching with Nikki Long. We decided to take turns teaching projects for the enrichment and it has worked out really well. The kids have been great – super engaged and have been creating good quality final products. Students have learned how to 3D print, sew, vector draw and we have tried to create products for our community. Lastly, I helped organize and facilitate the Maker ELO (Experiential Learning Opportunity) this year. In the past two years, this HS ELO has mainly focused on programming and some students making computers. 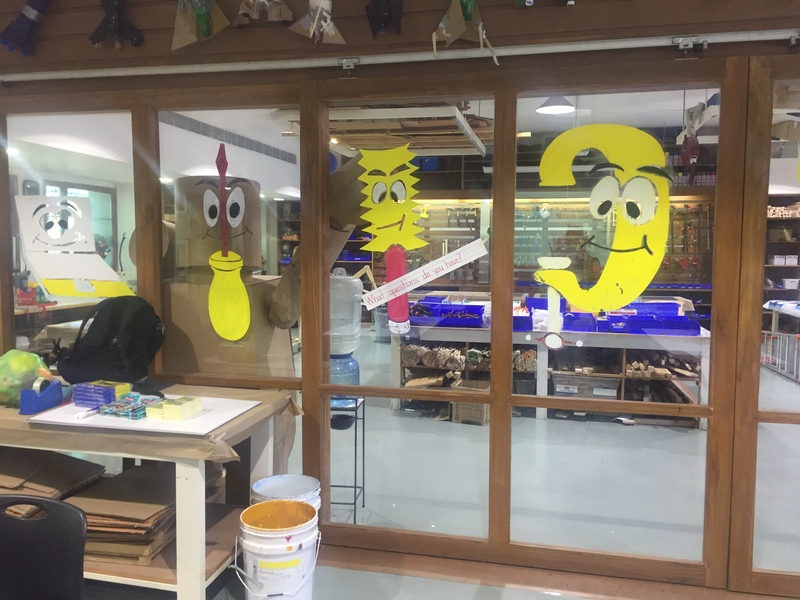 This year, I got involved as another place for students to go through the ISB Design process to create a product for a purpose. Next week will be the first time I have run this and I hope it goes well. While all other ELO groups have JUMP or other external companies supporting them, we are doing it all ourselves, which has been a lot of work, but it is aligned to the design thinking work students have been doing in other classes, but they can create and learn what they choose for their own experiential learning experience. and helping support the roll out of the K-12 STEAM program at ISB as it keeps growing. My office is in a library and our Office of Learning includes the EdTech/Design Facilitators and Librarians, so I should be working more with them! There were some MakerSpace/Tech presentations that I felt there were definitely enough sessions I could attend. It was during Chinese New Year holiday, so I wouldn’t have to miss any school and we could all go to India as a family. As soon as I walked in, I realized that I was not in my comfort zone – my connected, happy, social, familiar “Design and Tech PLN bubble” I had developed over the last ten years. And after a delicious Indian breakfast and more caffeine, I relaxed a bit, even though I was surrounded by hundreds of unfamiliar names and faces. I realized it was good to be a little uncomfortable and to embrace the situation. Very few people knew me (and I didn’t know a lot of people there) and the focus wasn’t necessarily on my needs, but I definitely could still get a lot out of the experience. 1. I met the Boyers from Shanghai American School and they are doing a lot with First Lego League. In short, we need to be doing this at ISB. I’m excited we have a new Computer Science/Robotics/Design/Science super-teacher joining us next year. I think he’s already offering this at his current school. I’m excited to start some conversations with him about our developing programs. If he isn’t going to offer this for MS, I think I need to step up and do something about it. Robotics and Programming are not my strengths, but I could definitely help facilitate a program like this and I really like the facets of the program from their core values to the research component to the designing and creating. 2. It was great to see the ES and MS/HS MakerSpaces. Roger was a gracious host and toured me around the secondary Design Space after our session was done in the ES Lab. It is always interesting to see what other people are doing and how they have organized their spaces. 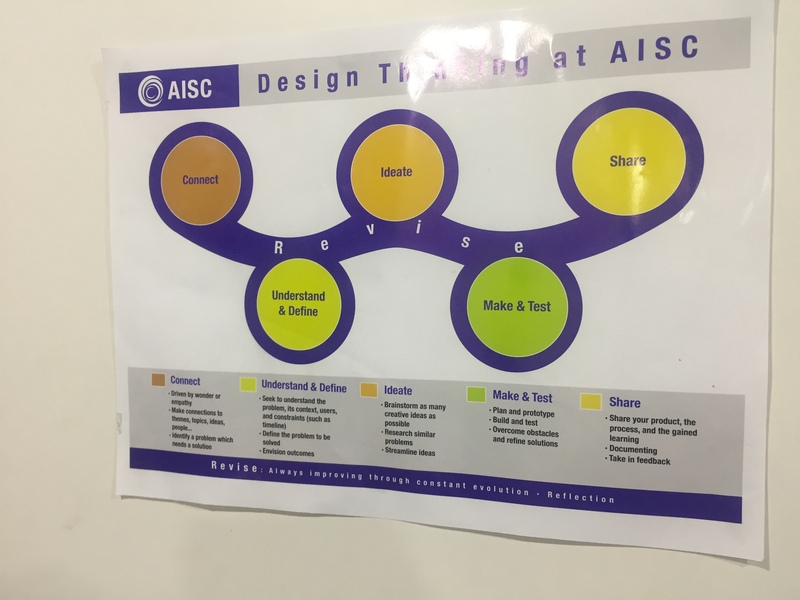 ACTION: Stay in touch with the Design and Maker teachers from AISC and MamaTechnology who is running an Open MakerSpace for Secondary Students at JICS. 4. Living Library – Catherine Buchanan presented how she organizes and runs her Living Library at Chadwick International School in Korea. While this is probably a bit out of my job description, it’s something that John and I would like to work together to develop for our middle school for the Fall. I love the idea of inviting people in as primary resources to engage students and for our students to learn more about all the amazing people in and around our community. We think we’ll try to schedule this event for Fall 2018. There are many schools that organize an event like this. Here are some examples: The Human Library and check out this article. More to come on this. The ECIS Library Conference was almost just the right amount of new ideas to come back with after a conference. Sometimes I come back with too many ideas and I am overwhelmed with what I want to do versus the amount of time I have to take action on some of my new ideas. I would say I didn’t have a ton of options that applied to me for a lot of the sessions, nor did I know enough people to pick out the “engaging presenters” that you could learn anything from. I feel like I can easily manage the four actions (above) and maybe I should look around for different types of PD rather than attending the same conferences in Asia that I go to all the time. They are excellent, don’t get me wrong, but it’s always a good thing to be out of my comfort zone every once in a while. This was a slide from Mr. Schu’s presentation, but I like that can apply to our MakerSpaces and has a deeper meaning – I think I’ll make one for the MS/HS Design Lab. Throughout my teaching experiences over the course of my career, I have frequently seen that EAL, Student Support or students taking multiple languages (all for good reason), often miss out on hands-on personalized learning experiences. These types of hands-on electives courses are exactly what these students need. They need authentic language experiences and safe but dynamic environments to flourish and develop both language and technical skills. Sparked from a conversation between our HS EAL teacher and our Educational Technology Coordinator, Clint, a new project was born to fill this need. Students were to find a client (another one of their teachers) and using the design process, they would creatively solve a problem of their client. Students first had to approach a client, and record their interactions as a language assessment to find out the problems or needs of their teachers. This is an important part of the design process as a designer needs to empathize with their client. For the students, this was definitely out of their comfort zone and they had to understand the requests and respond on the spot in a natural way. The students worked through the design process to create their final products. We offered sewing and vector drawing (to ultimately laser cut) workshops for small groups depending on the needs of their projects. Students were very engaged in this project and it has been a great way for students to extend their oral communication as well as problem solve and develop more technical skills. It has been great to get into more high school courses this semester. After my first year of working almost primarily in the middle school, I’ve been wanting to branch out more in the high school. As a long term goal, I would like to work more with the EAL and Student Support teachers, along with my EdTech Facilitator colleague to help develop authentic design projects to use as a frame work for language instruction, practice and learning. 2. I will model and support a culture of openness and sharing through collaborative practices, public reflection and celebration. c. I will facilitate personalised learning. #learnISB more than just celebratory e.g. feedback, advice, process, reflective goals, professional learning etc. Commitment to reflective professional learning through blogging. Showcase professional reflective practice. Develop an active blogging culture. Facilitate personalised learning through the development of authentic tasks. Engage co-teaching and planning, tech integration etc. And from these team goals, I have identified my own professional goals for the year. I have focused on Goal #2. Here are my three goals that will help support our team. I will try to tweet something once a week that is more than just celebrating student work. I will also seek other twitter accounts and educators’ social media as inspiration/models to help me think about how I want to share my passion about design thinking and STEAM in Education. b. I will blog more to continue to make connections with other educators, be a model for other educators and to deepen my own reflection, as I feel it is definitely enhanced by the act of writing it down, editing, revising and getting feedback. I love to blog. In my blogging hayday, I was managing, writing, sharing through three blogs at the same time and I loved it. However, that has dropped off the past few years. Being new at ISB last year, I found it hard to find the time to blog. This year, I am going to make more of an effort. I think having other bloggers on the EdTeach team and giving myself a specific blog goal (to post at least one reflective blog a month) will help me stay on track. The great part about all this, is the vulnerability of it and I know my own thoughts and practice will grow from sharing my own teaching and learning. This is HUGE, but something I feel really passionate about and am very excited about in my role as a Design Technology Facilitator. I want our students at ISB to go beyond scoring well on their IB Exams and walking away with an exceptional GPA as many of them do. I want to better prepare them for being a creator and creative problem-solver no matter what area they plan to study or be a professional in. I have to say, I landed a dream job this year. I don’t think this position exists in many places around the world. It is the perfect balance of teaching, curriculum building, leading, presenting, program development and designing collaborative spaces. That being said, I have learned so much this year. It is exhausting and amazing to move to a new country and school. I love seeing how different schools and systems work differently. Everything from the schedule to homeroom structures to communications to curriculum to human dynamics is different. It is always sometimes better and sometimes more challenging than other work places. When you put yourself into this newbie position, you are vulnerable, you have to depend on others and you learn, learn, learn and do your best. I didn’t have goals this year besides surviving and develop a Design program at ISB. I had an action plan to work with which definitely helped out. More importantly, I was very lucky this year to have a large amount of amazing people around me – both professionally and personally – new colleagues, old colleagues; new and old friends. And that is what made this year amazing. Not perfect. But a great first year, for sure. Creating a Design and Engineering Team to develop a K-12 Design Process for our school that connects design thinking with NGSS Engineering and can be used throughout our school – in classrooms, enrichments, After School Activities and even in our own practices of creative problem solving. We still have some work to do as our program grows, but I feel like we collaboratively created a process that we can all work with. I have developed standards and rubrics based on this process and will continue to make more support materials for teachers to use. 2. Being very active in classrooms – this was not so much my doing than the openness of the teachers I work with. I was frequently invited to co-teach, facilitate and work with many teachers this year. It was great to get to know our students, community and teachers so well in the first year. 3. Designing collaborative spaces for design thinking and engineering to take place. It was amazing to have an idea and over Winter Break a new design lab was born for MS and HS students. 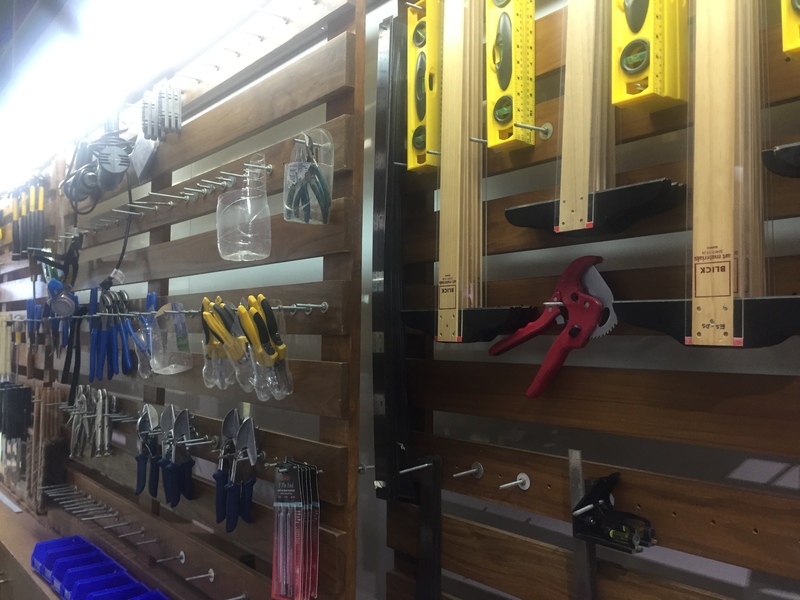 It is a great space (although basic) for students to tinker, learn, prototype, create and learn. To add on to this experience, there will be another space for ES students and teachers to use next year as we develop the Design & Engineering Program through the whole curriculum. Before I arrived, ISB had a lot of great opportunities for students to follow their passions, interests and curiosities to choose their learning. 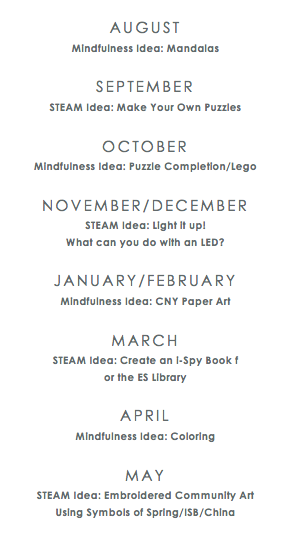 Middle School students sign up for enrichments – anything from band to yoga to robotics to textiles to game design to Genius Hour and everything in between. I was able to jump in and help coach and co-teach Genius Hour which was a fabulous experience. I worked with amazing teachers and we worked together to create a similar design in which students followed the design process to identify problem or opportunity and create a solution. I help facilitate other enrichments, and I learned a lot working with other teachers. I was able to “take over” One Day, which is a day that all MS students to design their learning. It was difficult to take it over when I had only experienced it through Twitter the year before. Due to a teacher leaving, I’m excited to be facilitating for the Passionate Project Class in HS, which will allow many middle school students opportunities to design their own learning experiences as they move through high school. Working with high school – Middle school is definitely “my space”. This MS being full of exceptional teachers who welcomed me in all the time, I didn’t always leave a lot of time for HS. I need to work harder to get into the HS. Students are enjoying the experiences they have in middle school and I don’t want their design thinking skills and creativity to take a back seat as they enter high school. Evaluating what I do and how it connects to what my role at this school is. This year, I rarely said no. I wanted to learn more about the curriculum and my colleagues because in my role, relationships are everything. Some work I took on, was beyond my job description, as it is with most teachers. However, next year, as I work with a new colleague coming in and have a better sense of the school, I need to articulate my role better and stay focused on what I can do well and impact student learning the most. I know this is something I will always struggle with and I feel like I want to do more and really be a part of a community, so I need to maybe even simplify this goal and think that if I take something on, I need to take something else off the plate. This is a big school with a lot going on, so there is always something to do.